The thought of Labor Day always seems synonymous with barbecues, family get-togethers, a day off, and especially, a potential weekend away. The three day weekend is often times the perfect weekend for a little getaway; a chance to relieve those working woes and truly celebrate the labor movement. That being stated, it is also the perfect reason to shop for a weekender bag. Weekender bags are perfect for that quick getaway, just big enough to fit essentials and just small enough to be easy to carry. If you’re someone who loves taking spontaneous trips, your weekender bag will become your best friend. Tip: Always keep your bag ready packed with some go-to outfits and travel toiletries. You can stash it in your trunk or your coat closet and you’ll always be ready to be on the move. When shopping for weekender bags, it is best to keep in mind what kind of traveling you do and how you pack. If you have mastered the art of light packing and your trips are often to environments with various climates, opt for something durable like a sturdy canvas or leather. Alternatively, you could opt for a nylon bag which will be much more light-weight and also store easily for the times you’re not escaping for a weekend. Below are some great weekender bags that I have found, which would be a great starting point for that next weekend getaway you plan. This Vera Bradley Weekender is the one I will be opting for. The quilted cotton makes for a classic, polished look. It is also available in the classic Vera Bradley colorful prints (though I chose the black) and it comes with a matching duffel. Stay stylish and organized with this beautiful bag; it even includes a bottom zippered compartment. The cool thing about the weekender bags from Pottery Barn is the option to monogram your bag for that personalized touch. This bag features wheels; are you sold yet? With all the amenities of a full-sized suitcase and the color option of purple, its perfectly accomodating to all your needs. A leather weekender bag can be a splurge to spoil yourself with. Why not? You’ve worked hard for it. This nylon weekender can double up as a gym bag & also features a yoga mat pocket. 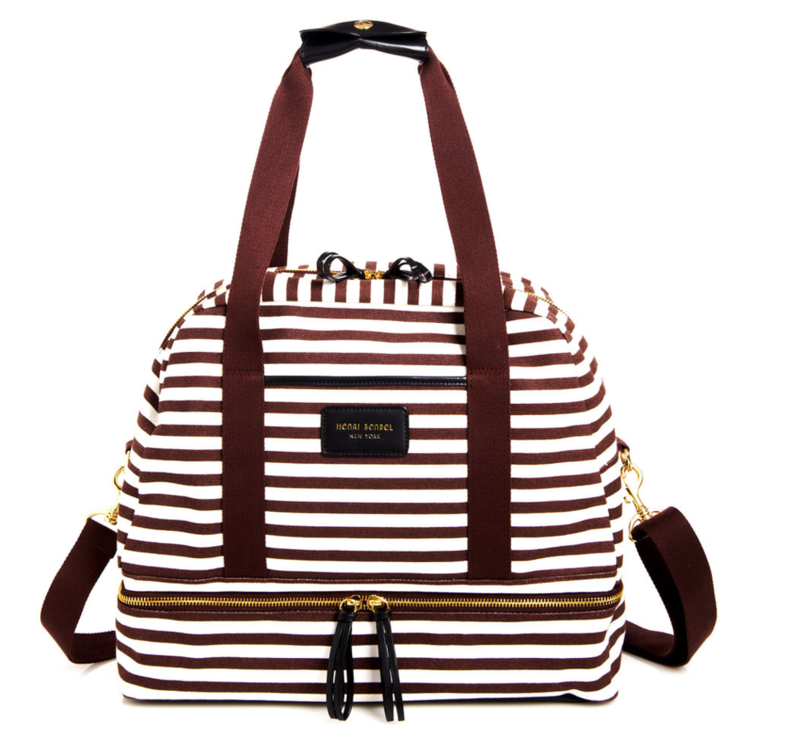 Sole Society offers this gorgeous weekender bag in gorgeous colors; the printed lining is fun too! Don't forget to pack your Sleeper Scarf too!